The Sierra Madre Tattler! : Will Trump's Tax Assault on Californians Kill Off What's Left of the GOP in the Golden State? Will Trump's Tax Assault on Californians Kill Off What's Left of the GOP in the Golden State? Mod: Obviously there are not all that many Republican office holders left in California. Trump's California tax hike could finish off what few are left. Trump Takes Aim at Last California Republicans (Bloomberg News link): It's hard to know exactly what shape Republican "tax reform" will take. Many details are missing from the "framework" that the administration presented this week. (Describing actions, or promises of action, by the Donald Trump administration often necessitates the use of quotation marks.) But it must have seemed a good idea to someone to complement Trump's culture war against liberals with a fiscal war. The deduction for state and local taxes, which is targeted for extinction in the White House framework, is most valuable in states where income and property taxes are high, such as California and New York. That's why ending it has been called a "tax attack on blue states." But it's amazing how many Republican donors and voters live in such states. Trump lost California to Hillary Clinton by more than 3.4 million votes, a greater margin than her national popular-vote win. Yet Trump received more votes in California than he got in Alabama, Arkansas, Louisiana, Mississippi and West Virginia combined. Americans Against Double Taxation -- yes, there is already an organized lobby against ending the so-called SALT deduction -- said that of the 20 districts nationwide with the highest percentage of returns claiming the deduction, nine have Republican representatives. New York alone sends nine Republicans to the House of Representatives, equaling the combined number of Republicans from Alabama and Mississippi. California sends 14. Democrats need to win two dozen House districts currently held by Republicans to take over the House in 2018. One-third of the top targets are in California, where seven Republicans represent districts that were won in 2016 by Hillary Clinton, and two other seats are also on the Democratic Party hit list. If you designed a policy to loosen the Republican grip on the party's last batch of California House seats, you could surely do worse than ending the tax deduction for state and local taxes. "They continue to try to figure out ways to alienate California from the Republican Party," said Democratic consultant Bill Carrick. California, where every statewide office is held by a Democrat, is already hostile territory for Republicans. Carrick, a longtime adviser to California Senator Dianne Feinstein, thinks Democratic candidates challenging Republican incumbents have gained a ready message with the proposal to end the SALT deduction. "My gut," he said in a telephone interview, "is they can make a pretty good case: Send them a message. Quit punishing California." Mod: In your guts you know he's nuts. And apparently so do a whole lot of other people. Poll: Majority wish Obama were president, as Trump labeled 'mentally unstable' (Yahoo.com link): A majority of Americans wish former President Barack Obama was still in the White House and in charge of the nation according to a new poll. A new survey from Public Policy Polling found that 52 percent of respondents wish Obama were in the midst of his third term. By comparison, only 41 percent prefer having President Donald Trump over Obama. But it's not uncommon for a former president to see his popularity jump after he leaves office. A 2009 Gallup poll showed that only 35 percent of people liked former President George W. Bush, but after he'd left office and the news that he had taken up painting emerged, his approval rating has jumped up to 59 percent. Unfortunately for the current president, the poll included many other negative ratings. The survey found 54 percent of people claim Trump is dishonest, 47 percent say he's mentally unstable and 48 percent call for his impeachment. Former President Obama has made only a handful of forays into the political conversation, but has joined his fellow ex-presidents to call for relief after Hurricanes Harvey, Irma and Maria battered parts of the United States. He's also continued to occasionally speak to the press on her personal life, recently admitting that he cried while dropping his daughter Malia Obama off at Harvard University this year. Obama even found some time to hang out at The Presidents Cup golf tournament with former president’s Bush and Bill Clinton. Unbelievable! The Orange One responds to mayor of San Juan, Puerto Rico's cries for help by tweeting odious racist dog whistle, standard in white supremacist attitudes and rhetoric about people of color! "They" don't work, "they don't help each other, "they" don't know how to get things done, "they" want to be given everything, "we" have to do everything for them, "they" are ungrateful to "us" for things done for them, the Democrats use "them" against "us" for political purposes, it costs "us" too much to help "them," etc. True. And after Irma Houston was an island, too. You guys are ridiculous. Rest assured, the federal govt is absolutely helping PR. Don't believe the hype. Many are working very hard to send help. Logistics are a nightmare in PR right now. 8:24 - "You're doing a great job, Trumpy!" No, I won't say great job, but you negative types are unaware and uninformed. It's just find any way to hate trump, facts be damned. Well, I work for the govt, and we are doing quite a lot, with direction from above, to help. But by all means, continue your warpath. People are dying and Trumps blames them. It is very obvious that when that man dies he is going straight to Hell. Burn baby burn. I think his boss, Mr. Putin, is a white supremacist. I agree. Trump is mentally ill.
Trump is the biggest piece of stupid hate filled idiot this country has ever had as a president. We can thank our Russian enemies for that. Divide the US is easy with a hater like the Dump. People are dying and he tweets. People are dying and Trump is lying. Mayor of San Juan is not joking - she just said "The world will see that we are not just treated like second class citizens - we are being treated like animals." Looks like Satan's spawn needs to be removed from office just like cutting cancer out of United States of America. 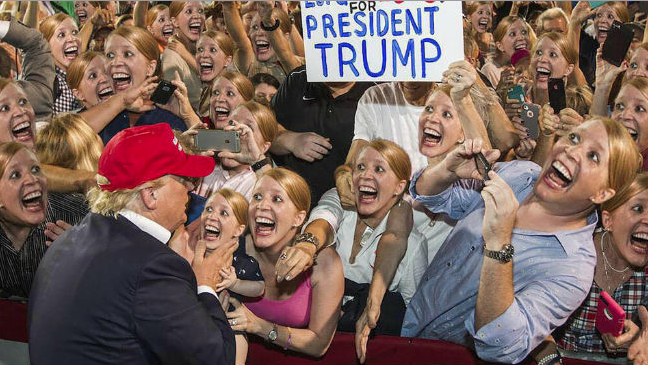 Is that a real picture of Trump with all those women with a little girl touching his hand? Seeing that picture is gross in so many ways. Bright enough to get you whining. Of course Trump is going to make Californians pay more federal taxes. He promised he wouldn't. You're doing a heck of a job, Trumpy. Tough subject on changing up taxes, the Tattler's fake ethnic empathy commenters can't even remain focused! Great time for Tax Reform, if anyone can do this, it is President Trump. I didnt realize California had any Republican representatives, they sure don't vote in the California Senate as Republicans. Just because California GOP Congressman don't dress up in Klan garb doesn't mean they're not Republicans. He is good at assisting the 1% and his swamp dwellers. 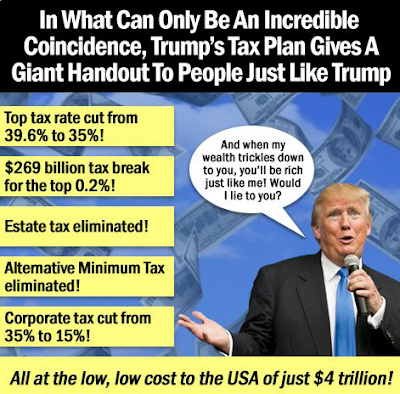 Why should middle class California taxpayers subsidize Silver Spoon Donald's tax cut? 9:08 is the kind of Trump supporter that takes both knees. 9:08 demonstrates clearly that the difference between Congressional representatives and members of the California Senate was not part of the curriculum of his St Petersburg high school. Hope Putin isn't too hard on him for giving himself away. It's ok. He wears kneepads. Behind the Iron Curtain, discrete talks being held directly with North Korea. The Mayor of San Juan could have made a difference in her plea of assistance vs the tweets, if she had been handing out that water sitting behind her during her face time on tv. Polluted water is what you think should be handed out? 9:17 wouldn't know. He drinks out of the toilet. Just where did those Billions of dollars disappear that the US sent over the years to Puerto Rico, for Electrical upgrades? The Power Plants are fully operational up and running, but the much needed power lines with their upgrades were never implemented by the Utilities owners? who is accountable? What is your opinion of the electrical grids in Florida and Texas? In 2008, Trump took over the licensing and management of a Puerto Rican golf resort, the Coco Beach Golf and Country Club. But the resort filed for bankruptcy in 2015, leaving Puerto Ricans with nearly $33 million in outstanding bond payments. No, but the empty space where 9:08's soul should be is black. W. got a 59% approval rating after leaving office because the public approved of the fact that he was now paintin' INSTEAD OF presidentin'. I don't see his dog portraits showing up in any galleries lately. 99.9% of gallery owners prefer W doing what he does best: clearin' brush rather than paintin' or presidentin'. The dog is worth more than his portrait. Soul Food is identified as Black, Creole, Cajun. Black Soul White Soul Yellow Soul Brown Soul Red Soul? Your soul has no substance? Death Tax? You enjoy taxes? So is it Amnesty Don or Taxman Don? Keeping track of his broken promises is a full time job. Don't worry. Mexico will pay for it. 2 out of every 1,000 estates pay estate taxes. "Where are the White People"
Eight years sweetheart, eight years. President Trump and his base of supporters are cleansing the swamp in DC of Consultants and Legislative dead weight from all political parties that are using the American voters as "useful Idiots". Wake up and recognize your political party dont give a #*#* about you. Considering that Trump is already showing clear signs of dementia, that is not a happy picture. AG Jeff Sessions and Hillary Clinton; how many years have they kept their affair secret? Kind of like you and your dalmatian. Lets Make a Deal***thank you Monty; God Speed.